Suncombe LiquiVessel ™ Liquid Storage and transport Containers are a range of fully sanitary liquid containers available in 316 Stainless steel, duplex or Hastelloy materials, developed for the specific requirements of the biopharmaceutical, personal care, healthcare, food science and beverage sectors. With standard vessel internals they are available with different external layouts. Available in capacities from 10 to 500 litres, with the option of custom design and manufacture for your particular requirement, they are manufactured to ASME BPE or food quality (sanitary), EHEDG and other relevant guidelines and are designed for longevity, robustness and economy. 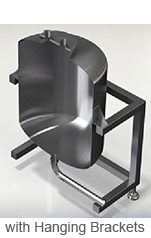 The LiquiVessel™s are available for movement on trucks or with castors and are stackable. Processing equipment can be added to the LiquiVessel™s. Available with Legs, for Hanging or in a Drum Body.